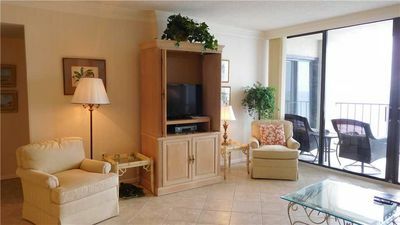 Gorgeous 1 Bedroom Oceanfront Carolina Dunes Condo! 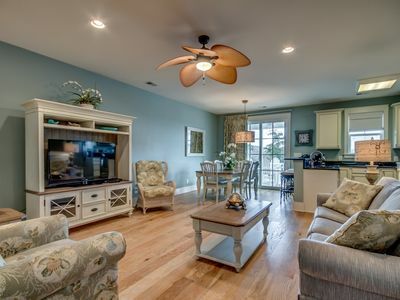 We are ready to welcome you to our Oceanfront 1 bedroom and bathroom Condo located at the beautiful Carolina Dunes in Myrtle Beach! 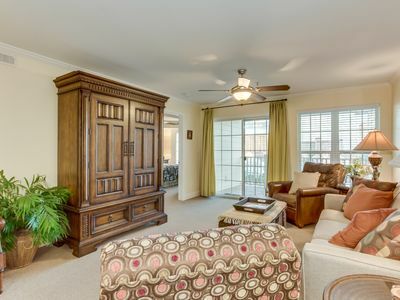 Our condo is available exclusively through The Caravelle Resort – the official On-Site Rental provider of Carolina Dunes with nearly 60 years of experience. 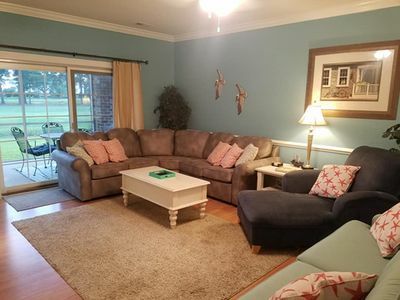 Your stay will include daily housekeeping service, complete with all linens and towels, and NO departure cleaning fee (like you’ll see on many other VRBO listings). You will also have access to our 24-hour front desk and you won’t have to check out until 11 AM. 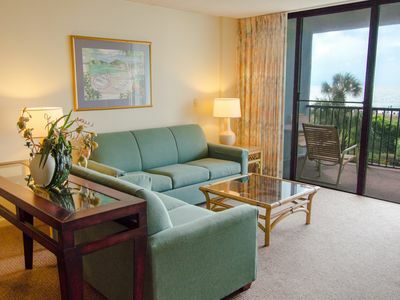 The master bedroom in our oceanfront condo features two queen beds. You can have privacy with the bedroom doors closed, just as if you were at home. It also has extra sleeping space with a sleeper sofa in the living room, which is great if you have others travelling with you. Our condo can sleep up to 5! 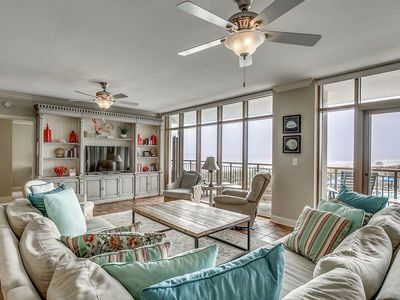 The condo includes an oceanfront living room, which is a nice option for relaxing after a day at the beach or just unwinding after a day in the sun. 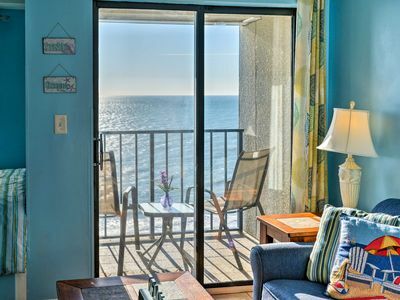 Right off of the living room is your own oceanfront balcony with chairs. 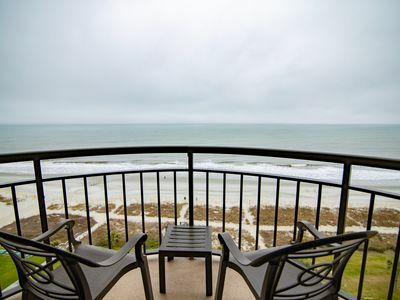 We love waking up to views of the ocean and watching the sun rise here! The living room is adjacent to the full kitchen. It has a stove/oven, refrigerator, toaster, coffee maker, microwave and cooking and dining utensils. Guests enjoy this option, because whether or not you plan to cook while on vacation, it’s still nice to have the option to store cold drinks and snacks. The condo also has a dining table and chairs. If you do want to go out to eat while on vacation the top-rated Santa Maria Restaurant is just steps away at The Caravelle Resort building. 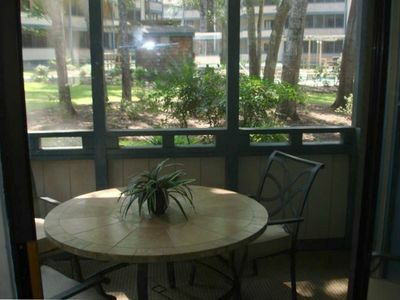 We know how important it is to stay in touch while on vacation, so our condo comes with free Wi-Fi. 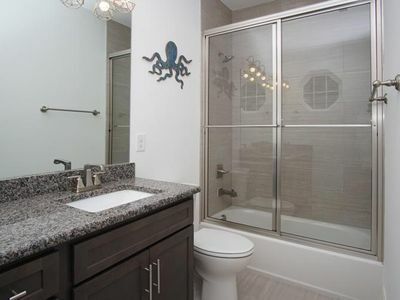 Included in the condo is a bathroom. 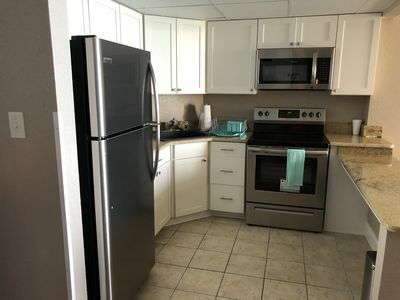 Our unit also includes the basics that you expect on your vacation including an iron and ironing board, in-room safe, hairdryer, a TV, blackout drapes, and a washer and dryer. We also have free parking (including motorcycle parking available next door) and a night security guard. 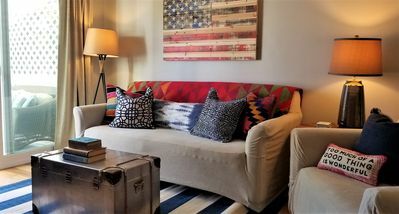 Our rental is available for Saturday – Saturday stays during the peak season and three night stays during the remainder of the year. 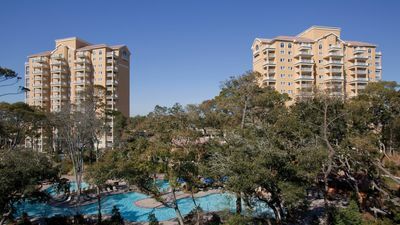 Carolina Dunes Resort has so many options for the whole family or for a couple on a romantic vacation. Enjoy such amenities as our giant outdoor pool deck with plenty of lounge chairs, tables with umbrellas and beautiful views of the ocean. 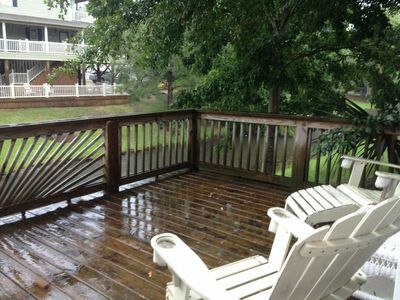 The deck includes a pool and kiddie pool, with beach access and outdoor showers. Plus, our building features elevators, free parking lot for cars, luggage carts and free Wi-Fi. There are also on-site dining options at The Caravelle. Since you’re renting through us, you’ll have full charging privileges to your room so you don’t need to carry around your purse or wallet to pay for your food and drinks. You can grab a cold cocktail from the in-season poolside Marco Polo or have an item from the grill to enjoy on the oceanfront lawn. There’s also the top-rated Santa Maria Restaurant, where you can have a delicious omelet made to order and enjoy the breakfast buffet. They also serve an unbeatable lunch and dinner with both indoor and outdoor seating available. 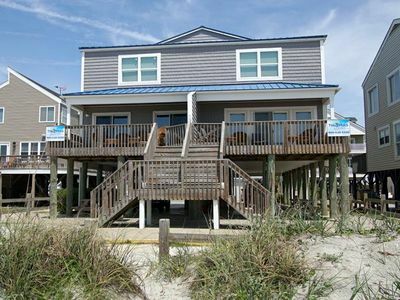 One of the things we love about Carolina Dunes is the convenient location. 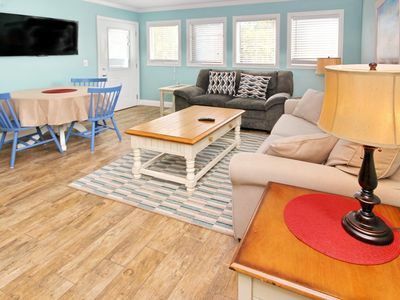 The property is located centrally in the Golden Mile section of Myrtle Beach, making it easy to get to places on both the south end and north ends of Myrtle Beach. 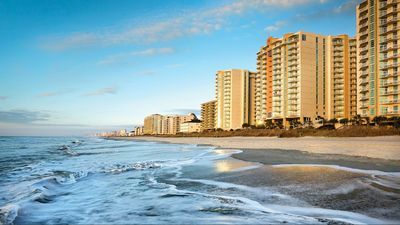 We are just a short ride away from Broadway at the Beach, Barefoot Landing, the Myrtle Beach Boardwalk, SkyWheel and so much more that Myrtle Beach has to offer. 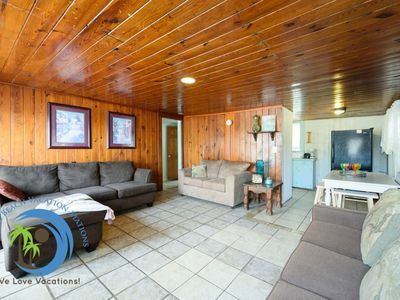 By booking our official Carolina Dunes unit from The Caravelle Resort, you have the confidence of reserving direct that you cannot receive anywhere else! -On-Site Maintenance - no waiting hours for an off-site person to show up! -FREE Daily Housekeeping - no extra departure cleaning fee! -Linens & Towels included FREE in your stay - no need to bring these from home or pay an additional fee! -Personal & Friendly Service - our staff are trained and ready to serve you with a smile. They truly care about you and your vacation. -11 AM checkout (you don’t have to worry about being out by 10 AM!) -And more! Don't risk your vacation by booking elsewhere, book direct and rest easy. We will take care of you and your vacation as if it were our own. CANCELLATION POLICY Purchase our Caravelle Resort Vacation Interruption Protection (VIP) Plan after booking to protect your vacation! 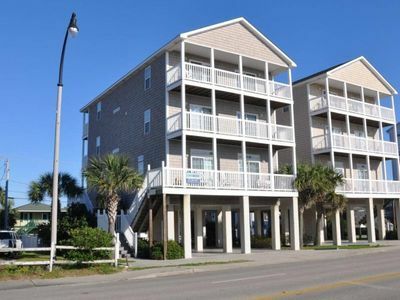 1st Floor Corner Unit....July 7-14th Available at a Great Rate!! 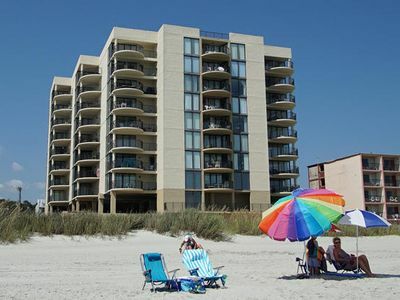 Oceanfront Myrtle Beach Studio w/View&Pool Access! 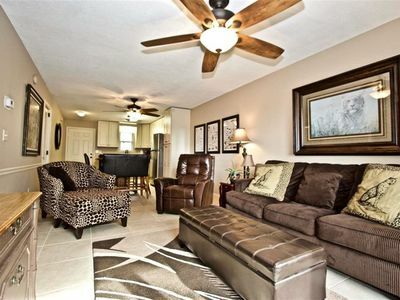 Modern 2 bed/ 2 bath condo just steps away from the beach! Shop at Coastal Grand Mall!